They range in height from 5’ 2” to 5’ 7” in both males and females. On average, they live between 750-1000 years and are the longest lived of the faerie folk. Sea Elves gain a +2 to Dexterity and a -2 to Wisdom. Like their Gray cousins the Sea Elves have a low resistance to Sleep and Charm as Elves go at only 25%. They gain a +1 to hit with any bow (except Crossbows) and with short swords, cutlasses, and tridents. Owing to their long life and great travel Sea Elves may begin knowing their maximum Intelligence limit of languages with no restrictions on choices. They are taught Elven, the Faerie tongue, and the languages of both Tritons and Merfolk without expending any proficiency slots. Finally all Sea Elves are skilled sailors and start with the Seamanship and Swimming proficiency as a bonus. 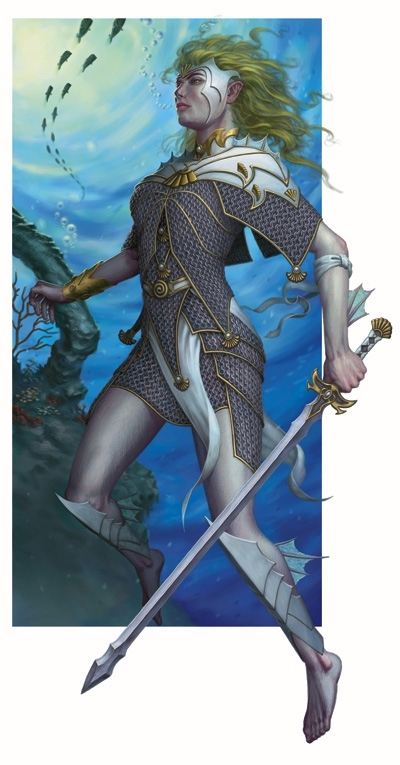 Sea Elves are free-spirited and even a little capricious by nature and are well-known as the most social and light-hearted of the Elven races. They maintain a kingdom called the Crescent Citadel from whence their fleets sail the known seas. They are great enemies of the Lithids who purportedly dwell in the ocean’s great depth. The Sea Elves have a king whose inheritance dates back to the earliest days of the Elves’ arrival on Aeres. The king maintains a greater parliament made up of the top one hundred captains in the fleet and his lesser parliament which includes his closest advisors.